Mizco International of Avenel, N.J., is recalling about 6,000 re-fuel power bank charging stations. The unit can overheat when it is being charged, posing fire and burn hazards. This recall involves the Re-fuel by Digipower Grab and Go Family Pack portable power bank charging stations. The power bank charger is a self-contained energy source used to charge cell phones and other devices when an electrical outlet is not available. 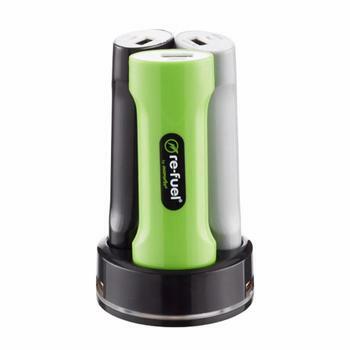 The unit consists of three (black, gray and green) 2600 mAh re-chargeable lithium-ion battery chargers that sit on a recharging docking station. Each power bank is oval in shape and measures approximately 3.75 inches long by 1.25 inches high by 0.75 inches wide. The charging stations, manufactured in China, were sold exclusively at The Container Store stores nationwide from October 2017, through February 2018, for about $40. Consumers may contact The Container Store toll-free at 888-266-8246 from 9 a.m. to 7 p.m. (CT) anytime, by email at contain@containerstore.com or online at www.containerstore.com and click on Product Recall Notice for more information.